Prof. Rory Wilson has done research for this too on African penguins. He released a lot of anchovies in a big, round tank. These formed immediately a swarm, and swam around in formation, which is normal for such fishes and is	called "polarised". 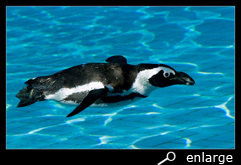 When he placed a few penguin-models in the water, nothing happened. But when he added a penguin-model, with a typical black stripe on the side, like all Spheniscus-penguins have, the anchovies panicked and swam around, leaving the formation. 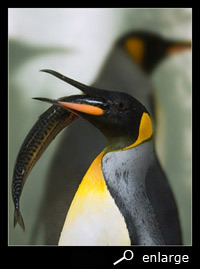 A living penguin would not have any problem catching the fishes. The goal of such "black stripe" is to break the formation of a swarm, so the fish can easier being caught. Why this is so, is still unknown, but they suppose that's why dolphins and whales have a similar line. To find out when and where penguins eat what, scientists of the "Alfred-Wegener-Institut für Polar- und Meeresforschung" developed a special sensor. A penguin is an warm-blooded animal (body temperature is about 39°C), but their prey has only a temperature of about -2 °C till + 13 °C. So when they eat, it is only logical that the temperature in their stomach will decrease. The sensor had to be small, indigestible and proof against pressure, but also able to record the correct temperature, and it should come out with a "gastric lavage". First experiments were no success, because the penguins spit them out again, soon after taking. So the moment of taking, had to be as close as possible to the moment they leave for a fishery. 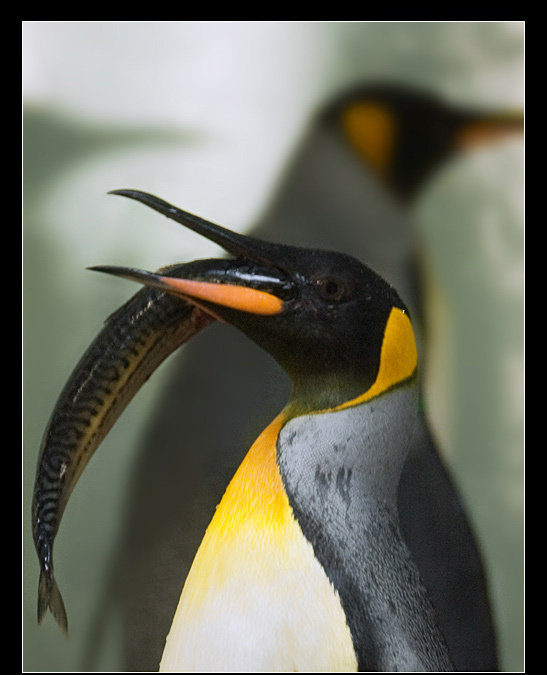 After several attempts, they succeeded and were able to determine what penguins eat. From time to time, birds do throw up the indigestible parts (fish bones) of their food. With a metal-detector and a lot of luck and patience, the sensors could be found again close to a nest. Maybe a funny anecdote: A colleague of Mr. Wilson, used such sensors for his research on king penguins and lost all of the 20 pieces. Even with a metal-detector he could not find them back in the colony. Till one day, observing a penguin who was feeding his chick, he realized what had happened. And indeed, the sensors were fed to the chicks. This method of research maybe seems a bit cruel too, but only when we know how they live, we will be able to increase their conditions of life and protect them. Penguins play a cat-and-mouse-game with their prey. 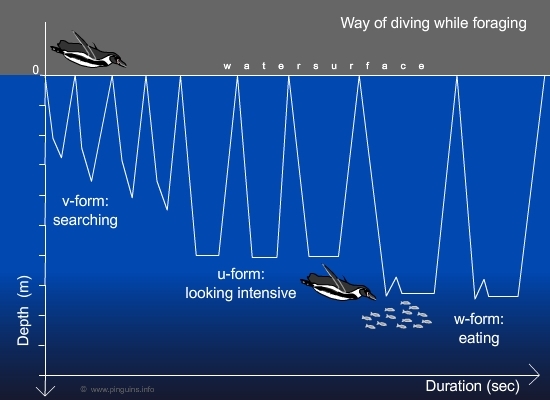 They start looking for fish by diving at a rate of 5 till 10 km/hr and under an angle of 5 degree till 85 degrees. On a certain depth they either swim a while horizontally or they ascend again under the same angle. Of course the fish tries to escape. 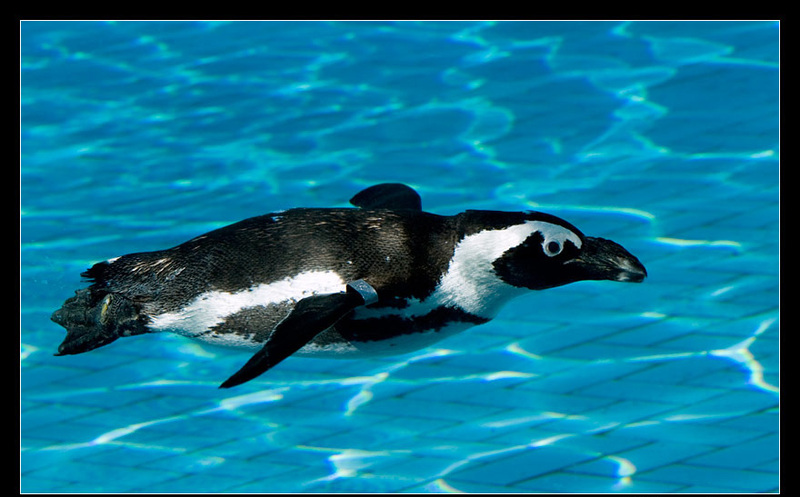 While penguins need air to breath, they have to go to the surface of the water after a few minutes. Luckily for them, their prey can't dive deeper either, because the lack on oxygen and food so deep in the water.